Hillary Chybinski: t-ball mom. 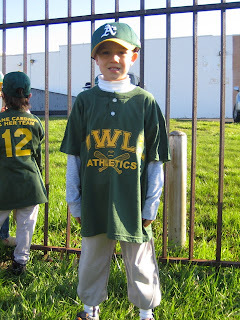 . .
. . .that's my newest endevor. . .Ryan signed up for T-ball and we had Opening Day on Saturday. So Saturday morning at 7:45 am, we all piled in the car with warm toasted bagels and coffee for mom and dad and went over to Oreland for the parade of teams. Ryan is playing for the A's - and we are in a crisis, because mommy cannot find green socks (or white with the green stirrup). . .who would think youth baseball socks would be such a hot commodity??? So now i'm putting picture day on my calendar and practices and games. . .today's practice was called due to snow - thats right - SNOW. On top of it all, we are having ourselves one dandy of a nor-easter - complete with driving rain, howling wind and an inch of snow. where oh where is spring??? So grown-up -- I might cry!